Cristina has a beautiful blog (no pun on words - lol)! This is how she describes herself & her blog: "My name is Cristina. I am just a 21 years old girl with a huge passion for makeup. I am from Romania, but I am studying in Finland, so for most part of the year I am in Finland. I love any beauty related things and I adore shopping for them. I started this blog mainly because my friends and family are not into makeup the way I am and I wanted to share my passion with people who share it"
Celeste has such a fun blog! - This is how she describes herself & her blog: "My name is Celeste and I reside in the suburbs of St. Louis, Missouri. Formally employed in the fashion and beauty industry, I am a married, stay-at-home mom to two imaginative little girls, ages 6 and 8 who keep me on my toes! We are a family who embraces technology. Technology has opened avenues for me, and I try to stay informed on anything new that launches and captures my interest. We are also a family who enjoys discovering fun and interesting things to do in the city, as well just staying in and finding creative ways to amuse ourselves." With our 8th CLIMB GIVEAWAY! Networking means helping each other grow!! 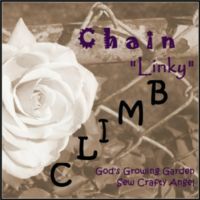 If you want to promote a CLIMB link, then use #ChainLinkyCLIMB on Twitter or Google+ so that we can all help each other grow! Enter for your chances to win $1000 Cash!! Thank you so much for everything, this is an awesome party! Hi Angelique - thanks for hosting. I just discovered your hop and posted for the first time. Good stuff here. Now following on G+ too. Thanks so much for the link up. It looks like it keep growing and growing with great posts. Great Job!